Myrtle Beach is an ideal place to take the whole family for a fun-filled vacation, and you will find we have many Myrtle Beach rentals to choose from. Myrtle Beach presents South Carolina at its best with a beautiful and picturesque stretch of beach that runs along the coast for 60 miles. When you stay in Myrtle Beach rentals your family will not only have a great place to rest and relax, but will also have shopping, dining, theatres and amusement parks close by as well. When looking at Myrtle Beach rentals to decide where you would like to stay, you need to consider the options you have available to you. Where you stay will depend on your needs, the needs of your family, and all of the activities and sightseeing you would like to do when on your vacation. For the ultimate relaxing holiday atmosphere, our Myrtle Beach rentals are the perfect choice, especially when you are on the oceanfront. You will be close to the action, and yet will experience the relaxed atmosphere and the renowned Southern hospitality. Regardless of where you choose to put your feet up, you will be able to find Myrtle Beach rentals that can accommodate your every need. 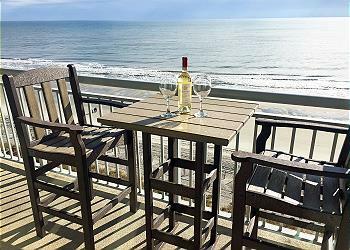 Listed below are Myrtle Beach Condos in the Carolina Resorts Vacations rental program for 2019. If you are interested in more details and availability of one of our Myrtle Beach Condos properties, click "More Info" listed in each vacation property description. 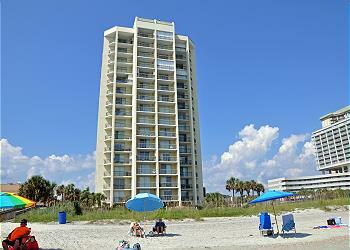 Great Myrtle Beach location on the quieter south end of Myrtle Beach. Meticulously maintainted unit with an oversized direct oceanfront private balcony. Grand Atlantic Resort is close to all of the attractions that you would expect from Myrtle Beach, and is located in a family friendly locale. This oceanfront Resort features 3 outdoor pools, 3 indoor pools, and a 170 foot lazy river are all featured at the smoke-free Grand Atlantic Ocean Resort. The indoor pools are heated year round and the outdoor pools are heated until it gets very cold. Bring the family and enjoy the children's pool, arcade/game room, and kid-friendly dining. A fitness center, free parking, and a restaurant are also offered. This oceanfront condo offers Free WiFi and 3TVs all FlatScreens including a 42 inch flat screen TV in the living room, and flat TVs in all bedrooms. The kitchen is fully equipped and includes, microwave, and coffee maker. There is a full size washer and dryer in a separate closet. This condo features ceiling fans in both bedrooms and the living room. Property is close to all that Myrtle Beach has to offer including, The Skywheel, Jimmy Buffets, Second Avenue Pier, Broadway @ the Beach, Landsharks, Cal Ripken, & the Boardwalk Unit is rated a Luxury Rental (This property does not allow boats, trailers nor motorcycles. You may ONLY have parking permits for up to 2 vehicles. Also pets are not allowed nor is the discharge of fireworks from the property, nor is the use of laser pointers.) THIS BUILDING & UNIT DOES NOT ALLOW SMOKING AND IS DESIGNATED A NON-SMOKING UNIT. This unit has a minimum age requirement of 25 years of age and the booking is to a group of individuals then all persons in a group have to be over the age of 25 years. This does not apply to mother and fathers with children albeit in those cases the parents must be over the age of 25. Rental Agreement is required! This condo was gutted in 2017 and totally redone... The wall was removed between the kitchen and living room. All new furniture, appliance, flat screen TVs, cabinets and furniture are ALL new for summer 2017. Holiday Towers is conveniently located in the southern part of Myrtle Beach, this is a very nice ocean view 2BR condo on the 4TH floor and is located on 6th Ave South and Yaupon and is located a short block off the the beach. The unit has almost 1100 square feet and includes large oceanview private balcony, central heat, air conditioning, 46 inch flat screen TV in living room, as well as a flat screen in each bedroom, a microwave as well as a washer and dryer. Internet access is also available and free WiFi. The property has an outdoor pool and tennis courts and hot tub, picnic area, outdoor grill and an elevator. Parking permits are required but there is only one vehicle allowed per unit, however additional parking is available in a pay for parking lot next door for $10 per day if you need to bring an extra car. It is ideal for family vacation with short walk to the Boardwalk, Second Avenue Pier, the Sky Wheel and Jimmy Buffets Land Shark Gril and the Family Kingdom Amusement Park! 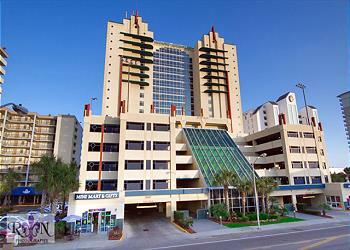 Great location convenient to all of Myrtle Beach's attractions. including all the beach activities from fishing on the Pier to para-sailing/banana boat rides, jet ski rentals and of course, don't forget beachcombing, sand-castle building and sun-bathing! Miniature golf, bingo, souvenir/beach shops, scooter rentals, pharmacies as well a variety of family fast-food restaurants are all within walking distance. Unit rating Well Maintained, Comfortable and Appealing (This property does allow motorcycles and only comes with ONE parking space for the unit. There is additional parking on the grass between Mitchell Drive and the fence. Please note that if parking there vehicle must park facing north and all 4 tires must be on the grass or the vehicle is subject to be towed. That parking is metered so there is a fee to park along the street. There are also parking garages close by that you can pay to park an additional car. Also pets are not allowed nor is the discharge of fireworks from the property, nor is the use of laser pointers.) This unit has a minimum age requirement of 25 years of age and the booking is to a group of individuals then all persons in a group have to be over the age of 25 years. This does not apply to mother and fathers with children albeit in those cases the parents must be over the age of 25. Rental Agreement is required! Kingston Plantation is a 145 Acre private and gated resort with resort amenities including sport and health club, and tennis (for additonal fees), also including multiple lakes, lush landscaping, restaurants, live moss covered oaks and of course the oceanfront! North Hampton Tower is the tower that KPH 1009 is located and it sits on a wide stretch of beach and the large ocean view private balcony is a dream! There are 3 televisions in the condo, along with a dvd player and Free WiFi internet. North Hampton Amenities include and indoor and outdoor pool plus jacuzzi's. Kingston Plantation is located in the Shore Drive area and near Restaurant Row, Myrtle Beach Mall and all of Myrtle Beach's great attractions are just a few short miles up the road. This unit is very well priced and perfect for your vacation to Myrtle Beach. Unit rating Well Maintained, Comfortable & Appealing (This property does not allow boats, trailers nor motorcycles. You may ONLY have parking permits for up to 2 vehicles. Also pets are not allowed nor is the discharge of fireworks from the property, nor is the use of laser pointers.) UNIT DOES NOT ALLOW SMOKING AND IS DESIGNATED A NON-SMOKING UNIT. This unit has a minimum age requirement of 25 years of age and the booking is to a group of individuals then all persons in a group have to be over the age of 25 years. This does not apply to mother and fathers with children albeit in those cases the parents must be over the age of 25. Rental Agreement is required! Savannah Shores 9730 Leyland Dr unit 4. 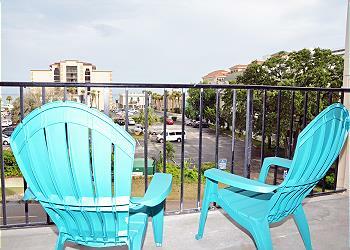 Great Myrtle Beach location on the quieter south end of Myrtle Beach. Meticulously maintainted unit with an oversized direct oceanfront private balcony. 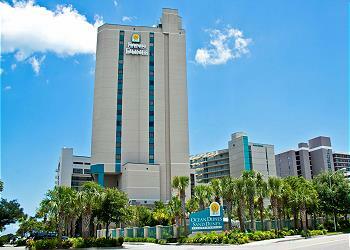 Grand Atlantic Resort is close to all of the attractions that you would expect from Myrtle Beach, and is located in a family friendly locale. 3 outdoor pools, 3 indoor pools, and a lazy river are all featured at the smoke-free Grand Atlantic Ocean Resort. The indoor pools are heated year round and the outdoor pools are heated until it gets very cold. Bring the family and enjoy the children's pool, arcade/game room, and kid-friendly dining. A fitness center, free parking, and a restaurant are also offered. This oceanfront condo offers Free WiFi and 4TVs all FlatScreens including a 55 inch smart TV in the living room, and smart TVs in all bedrooms, a DVD player in the living room. Kitchen is fully equipped and includes, microwave, and coffee maker. There is a full size washer and dryer in a separate closet. This condo features ceiling fans in all 3 bedrooms and the living room. There is an electric fireplace that is sure to please the winter tenant. The condo will feature all new living and dining room furniture in 2015 as well as new tile backsplash and granite counter tops in the kitchen. All new stainless appliances in 2017! All new Luxury Vinyl Tile in 2019. Property is close to all that Myrtle Beach has to offer including, The Skywheel, Jimmy Buffets, Second Avenue Pier, Broadway @ the Beach, Landsharks, Cal Ripken, & the Boardwalk Unit is rated a Luxury Rental Please note that rent is plus sales tax and fees. (This property does not allow boats, trailers nor motorcycles. You may ONLY have parking permits for up to 2 vehicles. Also pets are not allowed nor is the discharge of fireworks from the property, nor is the use of laser pointers.) UNIT DOES NOT ALLOW SMOKING AND IS DESIGNATED A NON-SMOKING UNIT. This unit has a minimum age requirement of 25 years of age and the booking is to a group of individuals then all persons in a group have to be over the age of 25 years. This does not apply to mother and fathers with children albeit in those cases the parents must be over the age of 25. Rental Agreement is required! Conveniently located in the southern part of Myrtle Beach, this is a very nice ocean view 3BR condo on the 2nd floor and is located on 6th Ave South and Yaupon and is located a short block off the the beach. The unit has almost 1300 square feet and includes large ocean view private balcony, central heat, air conditioning, 46 inch flat screen TV in living room, microwave as well as a washer and dryer. Internet access is also available with free WiFi. The property has an outdoor pool and tennis courts and hot tub, picnic area, outdoor grill and an elevator. Parking permits are required but there is only one vehicle allowed per unit, however additional parking is available in a pay to park $10 per day. It is ideal for family vacation with short walk to the Boardwalk, Second Avenue Pier, the Sky Wheel and Jimmy Buffets Land Shark Grill! 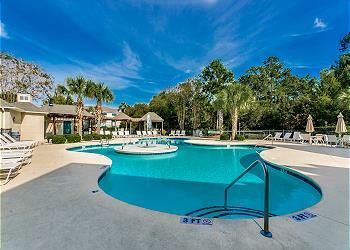 Great location convenient to all of Myrtle Beach's attractions. including all the beach activities from fishing on the Pier to para-sailing, banana boat rides/jet ski rentals and of course, don't forget beachcombing, sand-castle building and sun-bathing! Miniature golf, bingo, souvenir/beach shops, scooter rentals, pharmacies as well a variety of family/fast-food restaurants are all within walking distance. Unit rating Well Maintained, Comfortable & Appealing (This property does allow motorcycles and only comes with ONE parking space for the unit. There is additional parking on the grass between Mitchell Drive and the fence. Please note that if parking there vehicle must park facing north and all 4 tires must be on the grass or the vehicle is subject to be towed. That parking is metered so there is a fee to park along the street. There are also parking garages close by that you can pay to park an additional car. Also pets are not allowed nor is the discharge of fireworks from the property, nor is the use of laser pointers.) This unit has a minimum age requirement of 25 years of age and the booking is to a group of individuals then all persons in a group have to be over the age of 25 years. This does not apply to mother and fathers with children albeit in those cases the parents must be over the age of 25. Rental Agreement is required! Kingston Plantation is a 145 Acre private and gated resort with resort amenities including sport and health club, and tennis (for additonal fees), also including multiple lakes, lush landscaping, restaurants, live moss covered oaks and of course the oceanfront! South Hampton Tower is located and it sits on a wide stretch of beach with 3 oceanview private balconies! There are 5 large screen flat televisions in this luxurious 4BR 3 bath condo along with a dvd player and FREE WiFi internet. South Hampton Amenities includes a large outdoor pool and pool deck .Kingston Plantation is located in the Shore Drive area and near Restaurant Row, Myrtle Beach Mall and all of Myrtle Beachs great attractions are just a few short miles up the road. This unit is very well priced and perfect for your vacation to Myrtle Beach. Unit rating Luxury (This property does not allow boats, trailers nor motorcycles. You may ONLY have parking permits for up to 2 vehicles. Also pets are not allowed nor is the discharge of fireworks from the property, nor is the use of laser pointers.) UNIT DOES NOT ALLOW SMOKING AND IS DESIGNATED A NON-SMOKING UNIT. This unit has a minimum age requirement of 25 years of age and the booking is to a group of individuals then all persons in a group have to be over the age of 25 years. This does not apply to mother and fathers with children albeit in those cases the parents must be over the age of 25. Rental Agreement is required!